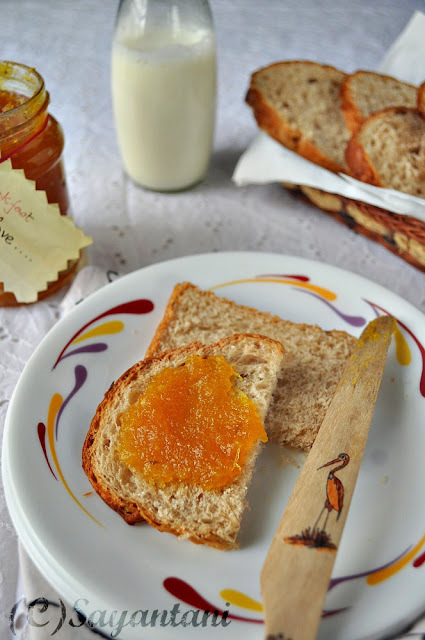 Pineapple jam has become a seasonal affair at our household once I figured out how easy the recipe is. All you need is pineapples, sugar little lemon juice and loads of patience. The first time though was like when you get lemon make lemonade kinda situation. My uncle sent 4 huge homegrown juicy and sweet pineapples for us and even after having them in almost everything we were undecided as how to finish the lot. So this jam was born. A brightly hued sweet and sour liquid gold. Since then we never stopped to get our daily dose of ‘sunshine on our breakfast plate’. For us this speaks summer and Mom’s love. I was brought up with such homemade preserves and am so glad to recreate that for my kid without much effort. To clean the pineapple first cut off the crown and then with a sharp knife peel the skin in wide strips. With the tip of your knife next remove the eyes. This will take little time. Next cut the pineapple in quarter lengthwise. Remove the center spie of the pineapple with your knife and chop them in big chunks. Next churn the pineapple pieces in your mixer jar. Do not make a smooth paste, rather keep some pieces small as that will give the jam some texture and provide bite. Place this in a big heavy bottom nn reactive pan with a lid. I used a non stick kadhai with glass lid. Add in the sugar and mix. Always start with less sugar as you can always add more if needed. Cover and keep it aside for an hour. Now start cooking it by placing the pan on medium flame. I cooked it on my induction cook top. Once it comes to a boil cover and let it simmer on medium flame for 40-45 minutes. Keep stirring from time to time so that it does not stick to the bottom. In the beginning the pineapple will release a lot of juice and then slowly it will start to dry up. My jam took a full hour to get to the required consistency. Do not make it too dry or thick as it dries up as it coold down. The consistency should be little more than spreadable. To check the doneness use the cold plate method. Cool a ceramic plate in the fridger section. Spread a spoonful of jam on this cold plate and cool it for another minute in the fridge. Run your finger through it, if it gets wrinkled with a skin and makes a clear path then the jam is done. Once you reach the final stage add the food colour and the lemon juice. Mix and let it cool in the pan. Pour in sterilized glass jars and store in fridge to keep it fresh for longer period of time. Always keep an eye on this jam while its simmering. 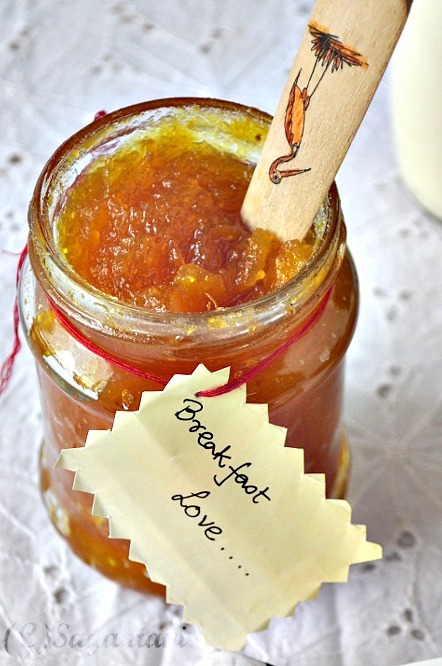 Sugar is very prone to burning and you don’t want to end up with a pot of cramelised jam. You can also add few drops of pineapple essence if the quality of fruit is not very good. Some also add cloves or cinnamon, I dint add as I don’t like other aromatics to overpower the original pineapple-y flavour. pineapple, pineapple recipe, jam recipe. jam recipes, how to make jam, homemade pineapple jam recipe, jam without pectin, no pectin jam recipe, 3 ingredient jam recipe, hoe prepare jam at home, easy step by step jam recipes, easiest jam preparation, homemade preserve recipes, pineapple recipes, pineapple jelly, jelly recipe, strawberry pineapple jam recipe, make pineapple jam. love it. Always have a jar of it. I make mine without the color though. Loving your bamboo knife too. Love this flavourful jam, wish i could make some soon. wow that looks so yumm..love your pictures! I too have that happy feeling whenever I make something like Jam or squash homemade:-)I bet this yummy pineapple jam made u super happy and proud! What a sunny jam, and the bread looks gorgeous too! Not to mention the spread knife!! 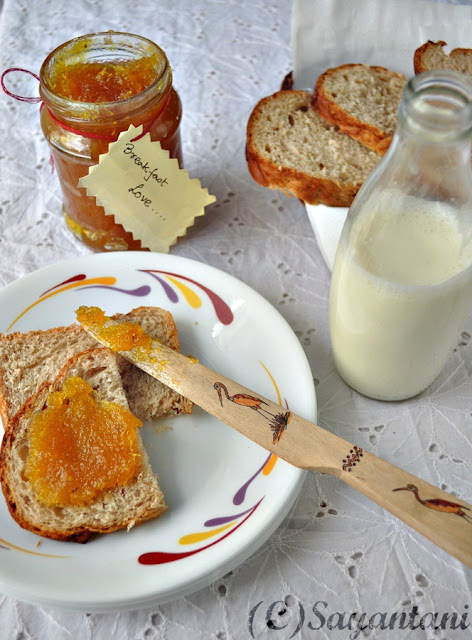 eautiful clicks...Jam looks perfect and delicious..
Pineapple jam is my favorite,love the clicks..
looks absolutely inviting and tempting.. very delicious recipe dear..
Inviting click, very flavorful pineapple jam. Perfectly made. Wow simply loved your description and agree with loving the old world charm!! Nothing can warm a mothers heart more than her child going 'Yummmmmmm' to her cooking. 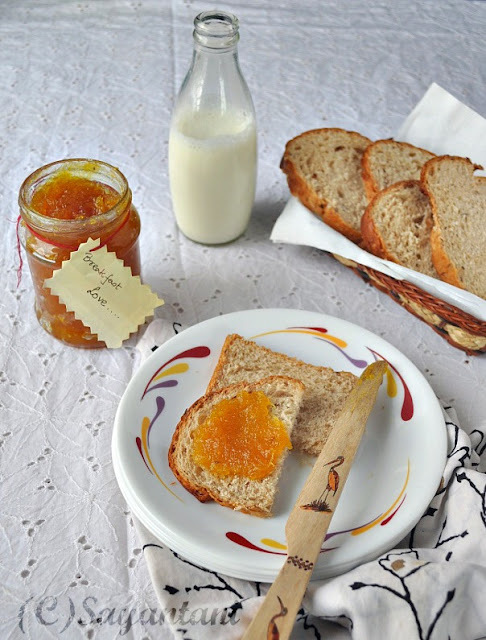 Tumi ki bhalo bhalo Jam banao bari te.. Ami ekta kuhre...only make guava jam at home !! Ki shundor lagche dekhte ...Am sure khete aro tasty hobe..
LOVE it :) Beautiful clicks and the jam looks so yum. It's time to try it at home. It is really a pleasure to serve your family with homemade goodies.The Pineapple jam looks perfect and is one of my favorite flavors.Nice presentation. I have a new blog and presently featuring Pujo Special Recipes to spice up your festival days.Please do visit.Thankyou.